Anyone who has ever had a truck, 4wd, work van or light commercial vehicle that needed selling fast can tell you how daunting this can be. It is hard enough to find someone to buy a scrap vehicle. The market for scrap trucks is even smaller. This, however, is only true if you have no idea about the cash for trucks industry. Otherwise known as truck wrecking companies. They buy used vehicles that are in any condition imaginable, and the best thing is that anyone with a junk automobile has a way to sell it, and fast. If you live in Sydney, the best truck wreckers in your area is Wreck Monster! We buy trucks and we don’t care what condition they are in. Your truck may be in perfect working order, and you just need a way to sell it as quickly as you can. You may not have the time to sell it any other way. Or you may need the cash fast. Or it may be a scrap truck that will never run again. We will buy it either way. Call us up at 0401 333 393, and take advantage of Sydney’s number one old truck buyer. When it comes to doing business with a used truck buying company who is completely Australia-owned, you can’t go wrong with Wreck Monster. You want the cash for Truck Company you do business with to be incredibly reputable. It raises the chances that you will get the most possible money for your truck. If you want a free quote, call the above number, or visit our website to fill out the quote request form. The first question in your mind could be, how much would I get for my old truck in Sydney? If your truck served you incredibly well over the course of its career, perhaps it is important to you for it to have the best possible funeral of sorts. In the case of the truck that is scrap and will never be driven again, it is nice just being able to sell your old truck. Whatever your personal situation is, you can expect only the best deal if you sell it to us. We pay a maximum of $15’000 for trucks depending on what condition they happened to be in at the time that you sell it to us. How to find the value of your truck? What will determine how much your truck will get from us when you sell it to us? We will be taking into account a few specific details. This includes the make of truck you are selling. We also look at the condition it is in, and what parts we can salvage. The model of truck it is as well as what year it was manufactured in also go into our appraisal of its value. In order to ensure that our customers end up with the most money, we also remove trucks at no cost! Before you sell your truck to us, you will want to know how much we will pay for it. That way you can shop around. Get a few different quotes from other companies. That is how you can be sure that we are willing to pay you more than any of our competitors. Or, you can ask us to match our competitors if they are offering more. So here is how to get in touch with us here at Wreck Monster in order to sell your broken truck for cash. Contact us by either getting in touch with us over the phone or by loading up our website on your computer and filling out the quote request form. When you do this, it will be important that you inform us on a few different details concerning your truck. We will need to know these details in order for us to provide you with the most accurate quote possible. The age, make, model and condition. We will get that free quote to you in no time at all! We love the fact that thanks to us, owners of broken down trucks that will never drive again can sell them fast. Otherwise, they would be forced to use the private market. Waiting for months for someone who salvages automobiles on the side to buy it off them. This can be a painfully slow process, which is why we are here to make it dead easy. We will not reject your truck if you offer to sell it to us. Regardless of what has happened to it to result in it being scrapped. You will have no trouble selling it to us whether it has been totally wrecked in an accident, or has been severely water damaged in a flood. You need to get rid of that truck, and we are here to help you do so by paying you the best cash deal that your truck deserves. 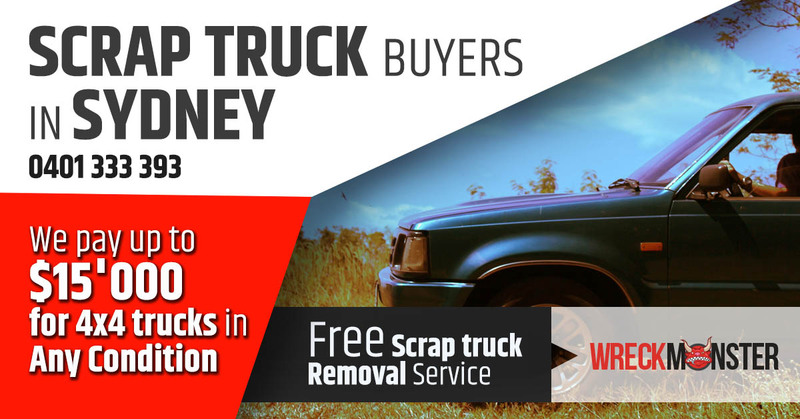 We will ensure that this payment isn’t compromised at all by offering free scrap truck pickups. It is of the upmost importance to us that everyone in Sydney has access to our amazing services. That is why we refuse to specialise in any specific makes or models. This is at odds with the crowd, as there are a whole lot of companies out there who do the opposite. They only buy one of the most popular brands, leaving a whole lot of other people out in the cold. We buy all the following truck makes: Toyota Hilux, Isuzu, Mack, Man, Mercedes Benz, Holden Colorado, Nissan Navara, Mazda, Hino, Volvo, Fuso, Isuzu, BMW and Ford. If you are looking for a company who will do right by the environment, as well as your bank account, you can’t go wrong if you choose King Auto. We recycle steel and other metals, making the mining of the materials less important. We also drain all the fluids ensuring they don’t end up in our waterways. More Information about vehicle recycling. So, if you have a truck that needs to be sold, get in touch with us! How much would I get for my old truck in Sydney? There comes a time when business owners feel the need to sell their old 4×4 trucks because of various reasons. It might be just too old to be used on the road or maybe it needs a lot of major repairs to be working properly. But in either condition, it may be risky to drive a deteriorated vehicle on the road. When you are in such a situation, you may think of towing your unwanted vehicle a scrap yard, donate it, or sell it to a 4WD truck buying company. But whatever option you choose you will want to earn the best money out of your automobile even if it is an old clunker. As a result, you might be curious to know that how much money you can really get for your old truck. Here we have listed some of the things that can increase or decrease the value of your 4×4 truck. The market demand of a specific kind of commercial vehicle highly affects its price. For instance, the auto removal industry is witnessing a huge growth currently. So, the people who want to include their business in this growing industry will need a fleet of high quality pickup trucks. You can use this opportunity for your benefit and do your research and understand about the ongoing market trends. If your old trucks show good demand in the market, then it would be best to sell them for a relatively good price. The demand for certain truck brands vary from one place to another. For example, there are certain locations where trucks of some particular brands hold great demand. For instance, in Australia the truck models of Volvo, Isuzu, Hino and Kenworth hold good demand. Therefore, if your old or used vehicle also belongs to one those brands, you can expect to get a reasonable price for it in comparison to other brands. Of course, all the scrap truck buyers will consider the current condition of your vehicle to decide an accurate price for it. They will check if it your used vehicle is still safely driveable or not. If your automobile is a complete scrap, then they will look for parts and components that are recyclable. All these factors help in deciding the rightful price for your old clunker. If you want to sell your damaged truck for a good amount of cash, it is important to check the current price of scrap metal. This will help you to get a good price for the useful metals and scrap parts of your vehicle. If the scrap metal prices are currently down, it means that the supply of scrap metal will be high. Thus, you won’t be able to get a good pay out for your rusty commercial automobile. Ultimately, there are a lot of factors that will influence the price of your automobile. Therefore, it is always good to do your research and prepare your automobile before selling it. When is the best time to sell my truck in Sydney? It is commonly said that the most useful vehicle that you can buy is a truck. If you want to successfully complete any kind of industrial operation, you need trucks in order to do so. For this reason, truck types have broadened to include many different variations. This includes such greats as the tipper, the flat bed, the box body, the container and so forth. They all have unique functions that they are used for, like transportation of vehicles, livestock, materials used in construction, and many more. However, no matter how useful a truck is, this won’t prove to be a barrier against the ravages of time. In fact, the more useful they are, the more they are used, and the more wear and tear accumulates over the years. Eventually, multiple parts and mechanisms will fall into disrepair, and the price of fixing multiple problems will be more than the value of a new truck. Here are some of the red flags that will alert you to a truck being ready for disposal. This sign is intimately related to the above red flag. You have been driving your truck for so many years that it can no longer handle the workload that you are inflicting upon it, and as a result the internal parts and systems are beginning to break down more and more often. You will be finding your truck needs to be repaired on a regular basis, costing you a lot of money as a result. When you have a business, and you have trucks that are integral to the smooth running of said business. Having it break down all the time will spell trouble. Deliveries won’t get to their destination on time, and this will cost you money. The worst thing you could do at this point is to just leave it and continue getting the truck fixed, instead of selling it to a wrecking yard and getting a new one. If your truck has a job that needs to be done. And it is instead spending all its time at the mechanics getting fixed. You will be understandably upset. Get rid of it. Kick it to the metaphorical curb by selling it to your local cash for cars company or wrecking yard. You will be much better off. Check out all about truck wreckers in Sydney. This is a sign that your truck’s age is beginning to compromise its ability to perform its duties properly. Breaking down frequently means that your truck has been on the road so much that it has built up an ever growing amount of wear and tear. This might have even caused you to have a few accidents. As a result of your truck breaking down in the middle of the road. If this is the situation you find yourself in, it is a pretty sure bet that your truck is on its last legs.